Give your skin a fresh glow with Ocean Quest Medi Spa Photofacial skin treatments. Intense Pulse Light (IPL) Skin Rejuvenation uses light therapy to deliver impressive, reliable, long-lasting results in the treatment of a variety of skin issues and aging signs. The skin rejuvenation treatments, which can apply IPL and Radio Frequency (RF)*, result in clearer, firmer, younger-looking skin in just a few sessions. By replacing damaged collagen fibers with new ones under the skin, the skin is encouraged to heal itself. Through selective photothermolysis, the process in which necrosis is induced, pigmented and vascular lesions are eliminated. Finally, by applying low-energy and short-pulse broadband light, this technology replaces skin imperfections with more youthful looking skin. The treatments effectively and efficiently tighten skin and reduce a range of aging signs, such as wrinkles and pigmentation. Long-lasting results can often be achieved in a relatively small number of treatment sessions. Treatments are non-invasive, clean and relatively painless. There is no unsightly evidence or visible irritation after treatments. Treatment plans are not demanding, usually consisting of one short session once a month. IPL treatments have proven effective for thousands of satisfied clients. 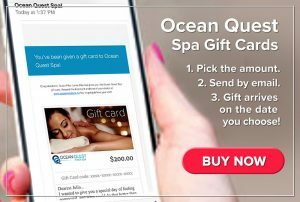 Let Ocean Quest Spa show you how easy it can be to give your skin that rejuvenated look! * RF pending FDA clearance.